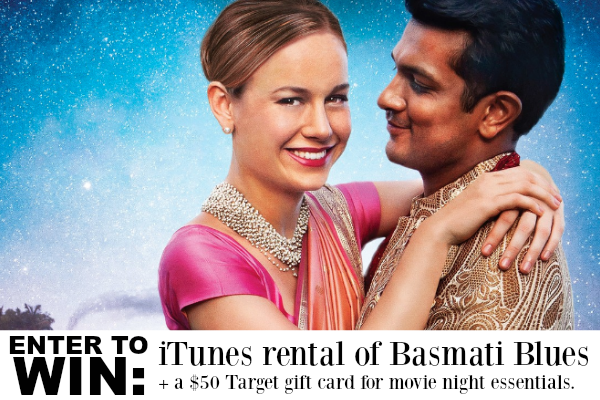 Valentine’s Date Night Giveaway: Basmati Blues + $50 Target Gift Card Giveaway! Looking for a the perfect romantic comedy for Valentine’s Day? I’ve got you covered! Opening in U.S. Cinemas and Video on Demand on February 9th is Basmati Blues, an enchanting musical romantic comedy that will capture your heart. Oscar®-winner Brie Larson leads a wonderful ensemble cast as Dr. Linda Watt (Brie Larson), a sheltered but brilliant young scientist who is sent on a work trip to India. She is welcomed by almost everyone, and embraces a world she is unfamiliar with. Linda is assigned a guide, an ambitious young bureaucrat (Saahil Sehgal) who immediately takes a liking to her. But when Linda meets Rajit (Utkarsh Ambudkar), a rebellious college student forced to drop out by lack of funds there’s instant chemistry! And through their playful antagonism, Linda’s eyes are ultimately opened to the fact she has unknowingly become part of a destructive plan against the farmers. When she and the villagers discover her company’s greedy agenda, they work together to fight against the abusive agricultural giant. Pulsing with the vibrant colors and rhythms of India, Basmati Blues features original songs written for the film by global artists Pearl Jam, Kristian Bush of Sugarland, Goldspot, Dave Baerwald, and Sonu Nigam. Boasting a fantastic ensemble cast from East and West, Basmati Blues is a love letter to multiple eras of thrilling Bollywood cinema, heart-stirring musicals, and indelible classic Hollywood romantic comedies. At its heart, this film is about people who reach across cultures, fight against corporate greed, and find love. I’m excited to share that ONE lucky She Saved reader (US only) will win a free iTunes rental of Basmati Blues, as well as a $50 Target gift card for movie night essentials. Prizing provided by Shout! Studios. « Sonic Drive-In Teams Up with Limeades for Learning + Giveaway! I like having a day just for me and my husband to share a meal and time together. I like seeing people get flowers. Setting aside a special evening with my husband! My favorite thing about Valentine's Day is spoiling my loved ones. My favorite thing about Valentine's Day is celebrating with my family. I like to make dinner, a special dessert and buy chocolates for my husband and daughters. I love spending quality time with my girlfriend. My favorite thing about Valentine's Day is that it is my sister's birthday. The love that is shared on this day! From my kids, Spouse, family its amazing. I like giving special gifts! Going out to dinner with my husband is my favorite thing about Valentines Day. spending time with my husband and children. My favorite thing about Valentine's Day is the discount chocolate after. One of my favorite things about Valentine's Day is that I get fresh flowers. I love having them in the house, especially if it's cold outside! The special gifts my kids have made me! I love making a gift for my husband for Valentine's day. I love giving sentimental cards and special treats (chocolates and homemade heart shaped cookies) to my loved ones on Valentine’s Day. Oh what I love most is making it exciting and fun for the kids! We love to order heart shaped pizza and play Valentines day Bingo! My favorite thing about Valentine's Day is spending the special day with my husband going out for a romantic date night at a nice restaurant. I'd say probably the excuse to eat chocolates & candy! It's the one time per year that I get flowers! I used to work with a lady that got flowers from her husband every week and I said I was going to marry someone that did that for me too. I didn't. My favorite thing about Valentines Day is the time that I get to spend with my wife. Thanks for the giveaway. I hope that I win. I love going out to dinner at our favorite restaurant with my husband. I enjoy working with my daughter on Valentine's cards.